What Is Cordyceps Mushroom Extract Powder? There are several species of Cordyceps Mushrooms, which belong to the family Clavicipitaceae, and many are used in traditional Chinese and Tibetan medicine. 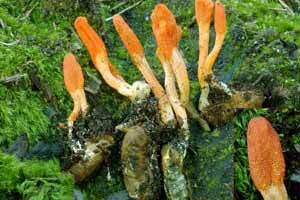 Cordyceps militaris is one of these species. Cordyceps militaris and the other species are an endoparasitoid fungi, meaning they are essentially parasites. For the most part, they choose insects and other arthropods as their hosts. The Cordyceps Mushrooms invade and eventually kill the host as the mycelium takes over the host tissue. The elongated, finger-like fruiting body can appear individually or can grow as a cluster or other shape. 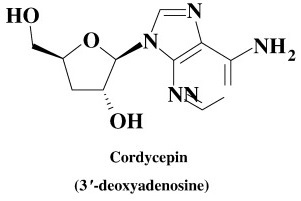 “Cordyceps” is derived from the Greek “kordyle,” meaning club, and the Latin stem “ceps,” meaning head, indicating the fruiting body’s club-like appearance. One of the first clear records of Cordyceps Mushrooms is found in a 15th-century Tibetan medical text written by Zurkhar Nyamnyi Dorje. At the time, it was referred to as Yartsa gunbu, and later it was named Cordyceps sinensis. Now this species is named Ophiocordyceps sinensis. It was mainly studied as an aphrodisiac. Many other Cordyceps Mushroom Extract uses have been found. These Cordyceps Mushroom uses can be traced to the active compounds, or chemical constituents, found in the whole fruiting bodies. These biochemicals are metabolized by our bodies and put to use in many different ways. Cordyceps militaris, the species used in our Cordyceps Mushroom Extract Powder, contains cordycepin, which contributed to an immunosuppressive drug that inhibits rejection of human organ transplants. Nootropics Depot and Nammex have partnered to bring you a high-quality Cordyceps Mushroom Extract Powder. Our certified organic whole fruiting body extracts are thoroughly tested to verify low starch content, an accurate percentage of beta-glucans, and no pesticide residue. These are very important factors to look for when choosing to buy Cordyceps Mushroom Extract Powder, because not all brands actually contain whole fruiting bodies and instead only consist of the mycelium ground together with the growing media, which is a grain such as rice. Mycelium is essentially the “roots” of the mushroom, whereas the whole fruiting body grows above the surface. The whole fruiting body contains a much higher proportion of the essential compounds that make the extract effective. While the mycelium may contain some, it’s simply not enough to be an equally effective product. In fact, there is even an FDA guideline that states mycelium cannot be labeled as mushroom. Still, it happens. Why would any producer purposely put out a product that is falsely labeled? Simply put, the substandard mycelium on grain production method saves time and money. You can test for yourself by mixing any mushroom powder with water and a drop of iodine. If the liquid turns dark blue/purple, this indicates high levels of starch (from the grain). Nootropics Depot tests all of our products for purity and authenticity. We are committed to providing only high-quality nootropic compounds, including our Cordyceps Mushroom Extract Powder. We partnered with Nammex to ensure that our customers receive an effective product that is produced and labeled ethically. Would you like to know more about the differences between our 1:1 and 10:1 Cordyceps mushrooms? Click here to read our Cordyceps blog post. As a dietary supplement, take 1000mg of Cordyceps Mushroom once daily. Get insight about other customers’ experiences by reading our Cordyceps Mushroom reviews below. Nootropics Depot offers 30g or 60g jars of certified organic Cordyceps mushroom 10:1 extract. Nootropics Depot's Cordyceps mushroom has been lab-tested and verified for both product purity and identity. I have been taking ND Cordyceps for a month and a half and I can honestly say my energy and motivation has improved dramatically. If anything there was slight libido increase. What can I say about these other than I love them! I've been taking a 1-1 1/2 grams a day for little over a month now, and have taken them regularly before in their mycelium versions, but this is so much more potent! I'll usually do a gram in my tea in the mornings, along with the shilajit powder, and have noticed much increased stamina and oxygen uptake over the time I've been taking them, with an overall feeling of wellbeing. I also take the white jelly and turkey tail mushroom extracts, but noticed other's saying things about softer skin, and have noticed that as well. I live in the deserts of west Texas, and my skin is the softest it has ever been, and I haven't changed anything as far as hygiene department, or my diet, other than adding in these mushrooms. I recommend these to everyone I come across. What can I say about these other than I love them! I've been taking a 1-1 1/2 grams a day for little over a month now, and have taken them regularly before in their mycelium versions, but this is so much more potent! I'll usually do a gram in my tea in the mornings, along with the shilajit powder, and have noticed much increased stamina and oxygen uptake over the time I've been taking them, with an overall feeling of wellbeing. I also take the white jelly and turkey tail mushroom extracts, but noticed other's saying things about softer skin, and have noticed that as well. I live in the deserts of west Texas, and my skin is the softest it's ever been, and I haven't changed anything as far as hygiene department, or my diet, other than adding in these mushrooms. I recommend these to everyone I come across. I use it on the workout days and it increases endurance slightly. It also boosts alertness and energy levels some. The taste is alright to mix in the morning tea, the powder is complete dry so it mixes and smells well. I have been taking 1 per day first thing in the morning and will continue to do so. I have been taking cordyceps for a while now and it is nothing short of stellar. I have much more energy, which leads to getting more done and wanting to work out more often. I also feel sexually "tuned in" while taking cordyceps; I find women more attractive and flirting happens much more naturally. It also seems as if I'm attracting more women, even when I'm not doing anything differently. My mood has been improved, my reduced, and I am enjoying life more. I feel and look healthier. To top it all off, I have had zero negative side-effects. I am a long-time cordyceps user ~ and do have on stock some of the real cordyceps sinesin, you know, the stuff that sells for 30 bucks a gram. Well, I've tried numerous versions, and even have munchable cordyceps militaris. Did notice something from several of these other versions, but nothing like this. Yesterday, I was truly not in the mood to do a LONG dictation that crunched 6 years of test data. I was committed to getting it done but really wasn't in the mood. I had recently received both this and the ALACAR, and decided to take both. Well...let's say that I was working on that "task" within 30 minutes and completed it expeditiously. That did get my attention, as I'm not one to have a problem with motivation but the data was so bad that it felt like going through it was giving me brain damage. Well TODAY, I have one more of those to complete. The data has already been crunched by me per se. It still had to be organized into a dictationable report. So before I took both of them, I thought I'd test whether the 10:1 cordyceps did it all on its own. I was amazed at the "mental" pick-me-up it gave, and rather quickly. I actually WANTED to do that paperwork. So, I came over here to order more and it was out of stock. Zoiks! I had tried a 10:1 cordyceps before and got no results even close to this. It was very mild indeed. So...I ordered the regular so I'd had some on hand while I visit you DAILY looking for you to get the 10:1 back in stock. Whatever you do, keep making it. Nootropics Depot Cordyceps 10:1 is incredible for helping boost my energy during workouts. I highly recommend it, I have taken other Cordyceps supplements but this one seems to be the most effective for me.